32CC Engine Conversion kit for 30.5cc 29cc 26cc fit baja Losi 5T DBXL FG. Normally If the item location is US, and your location is US, We certainly send out US warehouse. Your Location is other Country. And Item also in US. Customer in Most of Europe area. Customer in Brazil/South America area. Any inconvenience pls kindly understand. We will do our best and trust everything is can be settle by Communication. We will try our best to deliver 5-star customer service. Your satisfaction is always be our Goal. Our Customer service representative is here to ensure that you are satisfied with our services. Our company is a trading company, is specialized in the production of 1/5 RC cars & accessories which are widely welcomed by customers all over the world. 2 We have our own brand product, Our factory. We specialized in our engine, Wheel and exhaust pipe. 3 We have our own worksshops to assemble our cars. 4 We have rich experience in offering OEM services. 5 We have our own agent and showroom in Germany/UK. 6 Hope more and more friends to join our Top Speed Rc World and enjoy all! 1/5 RC CAR BAJA Parts. 1/5 RC CAR LOSI 5IVE-T. 1/5 LOSI Desert Buggy XL. Pull starter Gas RC Car Part for Baja Chung Yang Zenoah CY 5B 5T SS. Pull Starter complete Set for 1/5 Gas RC Car Baja 5B 5T 5SC King Motor Rovan. CNC metal rear shock tower set for HPI Rovan KM 1/5 Rc Buggies Baja 5B 5T 5SC. 4 hole crankcase with bearing and oil seal fit 29-30.5CC for BAJA 5B 5T 5SC. Remote engine Kill Switch Kit for HPI Rovan KM 1/5 Rc Buggies Baja 5B 5T 5SC. Alloy ball Joint Tie Rod End Sway Bar Link Kit fit 1/5 baja 5B 5T 5SC. 32CC Piston Kit for Zenoah engine fit 1/5 baja 5B 5T 5SC. Ignition Coil of RC Boat fit RCMK ZENOAH G260PUM Marine Gas Engine. Aluminum clutch bell carrier set Gray fit HPI BAJA Rovan King Motor 5B 5T 5SC. Flywheel fan cover fit 23-32CC Zenoah CY engine for HPI BAJA RV KM 5B 5T 5SC. 32CC Clutch cover fit 1/5 baja 5B 5T 5SC. CNC alloy skid plate mounting pin fit 1/5 baja 5B 5T 5SC. TSRC tubing pipe set for 1/5 RC HPI BAJA Rovan King Motor 5B 5T 5SC. CNC alloy oil tank pin fit 1/5 baja 5B 5T 5SC. 29CC 2 hole aluminum cylinder head upgrade parts for HPI BAJA 5B 5T 5SC. Crank Oil Seal for 23-30.5cc zenoah CY Chung Yang BAJA 5B 5T 5SC. 32CC crankcase bearing Zenoah engine for 1/5 baja 5B 5T 5SC. Aluminum clutch bell carrier set Silver fit HPI BAJA Rovan King Motor 5B 5T 5SC. 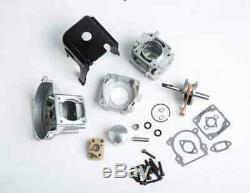 29CC 2 hole aluminum cylinder head and Piston 36mm Kit for BAJA 5B 5T 5SC. Front shock boot fit 1/5 HPI Baja Rovan KM 5B 5T 5SC. TSRC Silencer Muffler set for 23-35cc Gas Motor Engine fit KM HPI Baja 5B 5SC 5T. Alloy ball Joint Tie Rod End Sway Bar Link Kit Silver fit baja 5B 5T 5SC. 6000 RPM Clutch block for CY Zenoah fit 1/5 RC BAJA Zenoah CY 5B 5T 5SC. Rear shock boot fit 1/5 HPI Baja Rovan KM 5B 5T 5SC. LED Light Pod Set fit 1/5 RC Buggy HPI BAJA RV KM 5B 5T 5SC. 6000 RPM Spring Red color for CY Zenoah fit 1/5 RC BAJA Zenoah CY 5B 5T 5SC. Plastic roof guard fit HPI BAJA RV KM 5B 5T 5SC. Plastic RC Car cylinder cover fit 23-32CC Zenoah CY engine for HPI BAJA RV KM. Limited stock, what are you waiting for? The item "32CC Engine Conversion kit for 30.5cc 29cc 26cc fit baja Losi 5T DBXL FG" is in sale since Tuesday, December 15, 2015. This item is in the category "Toys & Hobbies\Radio Control & Control Line\RC Model Vehicle Parts & Accs\Body Parts & Interior\Cars, Trucks & Motorcycles". The seller is "crazyrccar" and is located in Shenzhen, Guangdong. This item can be shipped worldwide.